I love Valentine’s Day! I think I love baking for Valentine’s Day more than the actual Valentine’s Day. I wanted to bake cookies, but thought brownies would be a lot easier to cut out since you cut the hearts out after you bake the brownies. I have made heart shaped brownies with a chocolate icing. My kids think I should have my own bakery, I do, it’s called Nettie’s bakery, just for friends and family! Bake the brownies first, then cut out brownies with a heart shaped cookie cutter. Decorate with your Valentine colors: red, pink or/and white. Share with the one’s you love! Happy Valentine’s Day! From Nettie’s Bakery! This is the best brownie recipe! Use a cookie cutter to cut out the brownies, decorate as you wish. Happy Valentine's Day! Makes a 9″x9″ pan of brownies. For best results, eggs should be at room temperature. Add two eggs and mix until smooth. Then add baking powder, salt and cocoa powder. Prepare baking pan with non-stick foil or wax paper. Place baking pan and batter in the freezer for about ten minutes. Then, bake for 20-25 minutes at 350(F). Melt butter and stir in cocoa powder until smooth. Stir in two tablespoons milk or cream. Run whisk through powdered sugar to remove any large clumps or lumps. Add chocolate mixture to powdered sugar and mix well. Add another tablespoon of milk if needed for consistency. To prepare brownies with icing, spread the icing on the brownies while the brownies are still slightly warm. This will melt the topping, magically turning it into icing! I dipped the brownies into the icing and let it cover the entire brownie. Before the icing sets up, sprinkle pecan pieces (or any chopped nut or candy) on top. I sprinkled tiny red balls and white iridescent candies over the brownies. Allow to rest and cut into bite sized pieces. 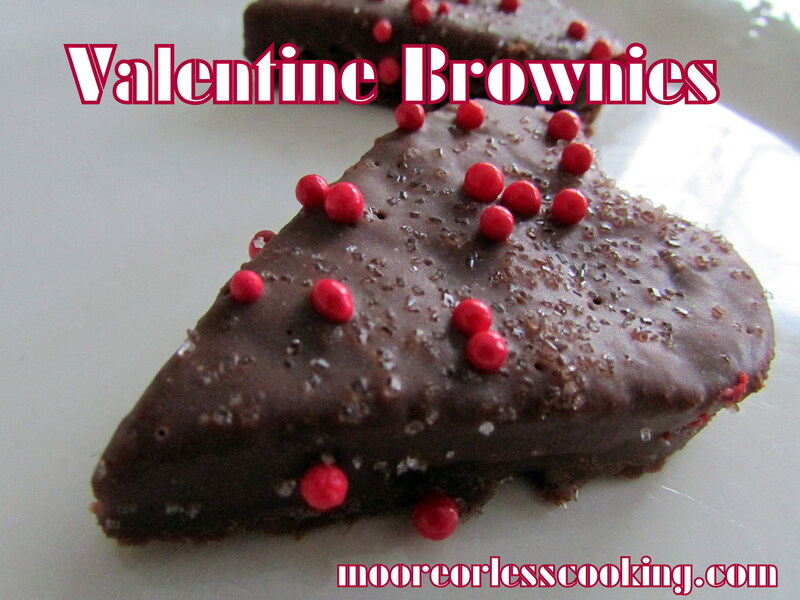 You can also use cookie cutters to cut the brownies into fun shapes ( I used a heart shaped cookie cutter to make the Valentine Brownies). To prepare brownies with frosting, wait until the brownies have cooled to room temperature before frosting. Sprinkle with nuts or candies, if desired. Love these Nettie!! Pinning to my holiday board. These are SO cute Nettie. You are speaking my language of love with chocolate, LOL. Such a cute idea! I made brownies recently, but not in a heart. These are so fitting more Valentine’s Day! I love Valentine’s Day too! Your Brownies are so cute and they look delicious too! beautiful! Will you be my Valentine? These looks so yummy!